Brett Romberg was an outstanding all-around athlete at Belle River High School in Windsor, Ontario, Canada, setting the Ontario high school shot put record and was a provincial javelin champion. He also played basketball and represented Team Ontario and played for Team Canada in baseball, but it was Brett's skills as a football center that brought him to the warm climate of South Florida. Romberg was the second-rated football player in Canada, was named an all-star, Rookie of the Year and Offensive Lineman of the Year in the Canadian Junior Football League following his senior season. At Miami, he got his chance to start at center beginning with the 2000 campaign, and would become the anchor to arguably the greatest offensive line in college football history. Brett started 37 consecutive games and would call most of the blocking schemes as Miami won 35 of his starts, including the 2001 Championship game in the Rose Bowl. Miami would have three consecutive 1,000-yard rushers in James Jackson, Clinton Portis and Willis McGahee and the offense would average over 460 yards per game with Brett anchoring the offensive line. 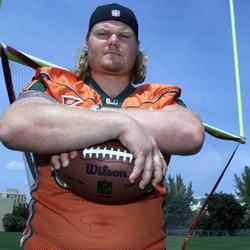 During his UM career, Romberg would not allow a sack as the Canes won 3 consecutive BIG EAST Championships. Brett is proud to be the first member of his family to get a college degree, earning a Bachelors of Business Administration and going on to get his Masters in Sports Administration. He and his wife, Emily, reside in Miami, where Brett works in market development for Tire Group International.